One of the many things I love about our beautiful industry is the lovely brides we get to meet every day. Brides coming to try on some of the most beautiful wedding dresses in Melbourne and match their jewellery. Glittering bridal bracelets styled by Leah S Designs and the jewellery sets to match. 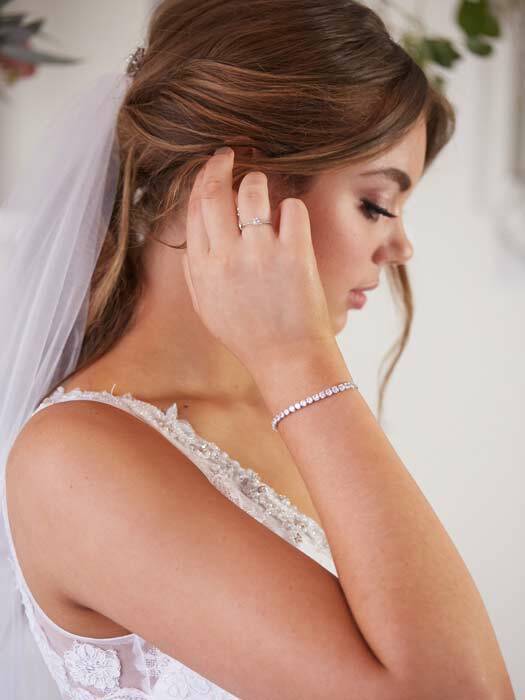 Our best selling Sophia wedding bracelet is a popular choice for contemporary and time less stye. Just one of many styles available at our Melbourne bridal Shop. Also now in store the full range of Hello Lovers Australia bohemian jewellery for the bride who dares to be different. All made in Melbourne. 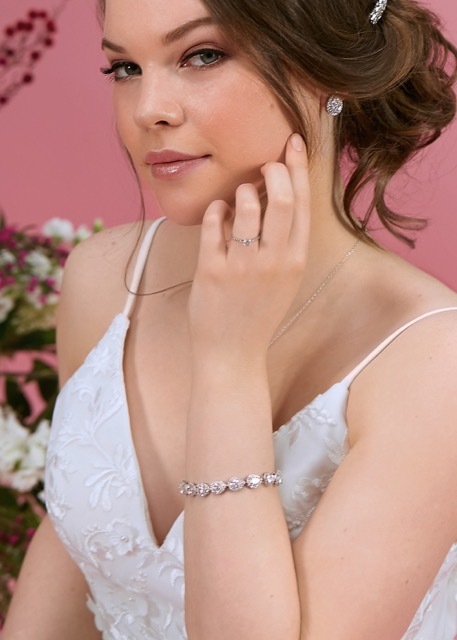 Of course wedding dress jewellery should be delicate and complimentary to both your gown face shape bridal hair style and gown. The endless choice available can make it hard to know what is right for you. That is why our highly trained staff is here to help. Leah S Designs prides itself on their range of jewellery not just bracelets but necklaces earrings and wedding dress belts. Bridal belts designed to trick the eye with tapered design features that make the waist look smaller. Complimenting your curves. 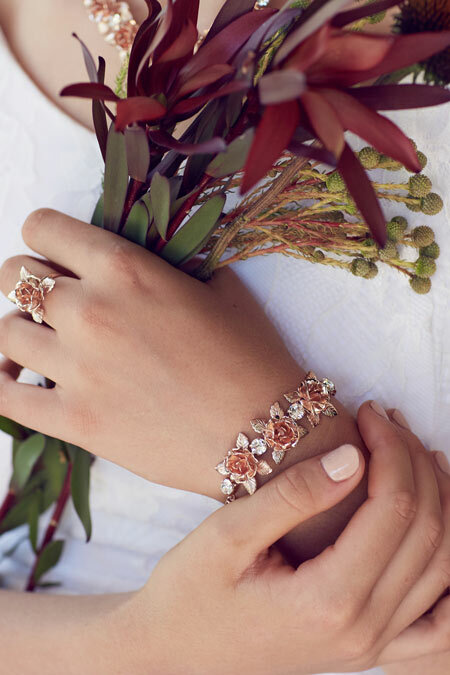 If using your bridal bracelet as your statement jewellery piece choose something bold and build your look around it. Maybe choosing a statement pair of earrings to compliment it. And possibly leaving the necklace and tiara out of the equation. You don’t want to look like your 4 year old self dressing up to go to the make believe ball. You want your look to be memorable for all the right reasons. If you are looking at long sleeve wedding dresses then possibly leave the bracelet out of the equation for this look as well. Wedding veils also available all lengths short or long white or Ivory. Veils can be made to your individual requirements as they are proudly made in Melbourne. Using the finest bridal tulle and there are many different trims to choose from. Bring your gown in store and we will assist you to put together the perfect veil and bridal bracelets for your gown. Of course wedding dresses all styles sizes 6 to 34 in stock. Situated in the south eastern suburbs of Melbourne Leah S Designs boasts one of the most extensive range of gowns Melbourne has to offer. Also the only bridal store in Australia with the full range of plus size perfection bridal in store for you to try on. White an Ivory wedding shoes featuring all heel heights from the ballet flats to platform heels. Sizes 6 to 13.